The Starflex Layflat Fire Hose from Delta Fire is a high quality fire hose widely used by Fire Brigades and Industrial Users constructed with an all Synthetic Woven Polyester Jacket providing strength and durability but maintaining a lightweight feel. 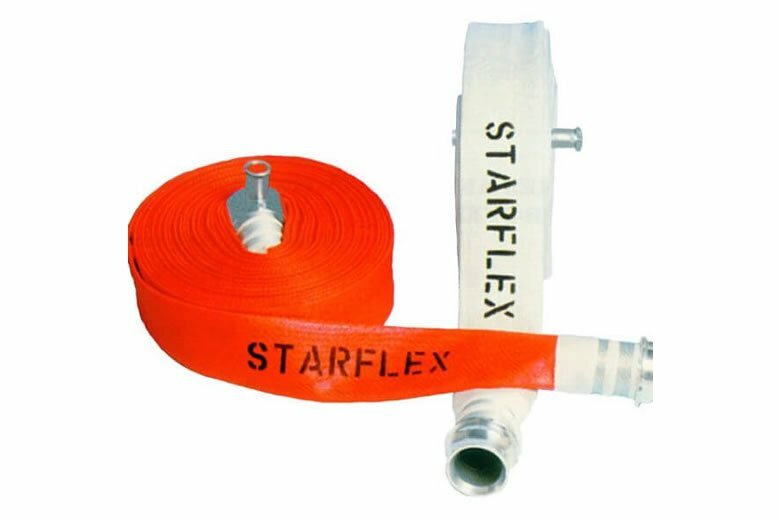 The Starflex Layflat Fire Hose is ideal for all general purpose uses such as wash down, water transferal and dust suppression. Thanks to an Ultra Smooth black Low Friction-Loss Synthetic Rubber Lining the Starflex Fire Hoses are Tough, Hard Wearing and yet still Flexible and easy to handle. Starflex Fire Hoses meet the requirements of BS 6391 for Type 1 & 2 Fire Hose and is M.E.D (Ship’s Wheel) approved for Marine use . Starflex Fire Hoses are suitable for use with Sea water and Brackish Water in the toughest of climatic conditions and are immune to mildew and bacteria. International fittings (Light Alloy or Gunmetal) professionally wired on over Synthetic Guards. If you are looking for High Quality Fire Hoses for Multiple Applications then make Starflex Fire Hoses your No.1 Choice.